Home → Blog → Cow or No Cow? Which is the best milk for YOU? Why do we drink milk? Primarily for calcium and protein, as an ingredient for cooking/baking, and as an accompanying “wet” ingredient for cereal. But I believe most of all, it’s “what we have grown up with”. Here are key points, good and not so good, for you to consider when making the choice that is best for you and your family. Also worth noting, these go beyond liquid “milk” and include yogurts, ice cream and more – so take a look around your grocer’s dairy and freezer section the next time! And as always, consult your doctor if you have questions about what is best for your needs, especially when allergies are concerned. It’s low in calories and contains no saturated fat. 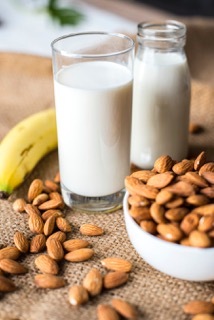 It’s a good source of vitamin A and can be fortified to be a good source of calcium and vitamin D.
It’s vegan and naturally lactose-free. 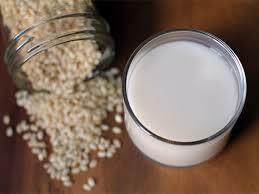 Plant foods such as sesame seeds, almonds and dark leafy greens are some of the best sources of dietary calcium. Calcium and phosphorus in these plant foods is much more balanced and allows for calcium to be better absorbed in the body. It’s not a good source of protein. May contain carrageenan, which may cause digestive issues in some people. There are some environmental concerns about the amount of water used to cultivate almonds. 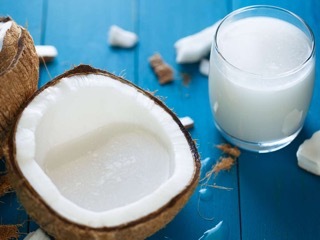 Good source of protein, vitamin A, vitamin B-12, potassium, and isoflavones, plus it can be fortified with calcium and vitamin D.
Contains as much protein as cow’s milk, yet is lower in calories than whole milk and about equal to the calories in 1 percent or 2 percent milk. Contains very little saturated fat. Soy is a common allergen for both adults and children. 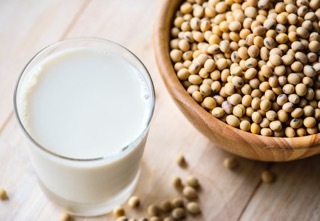 Too much soy may be a problem for people with thyroid conditions. Most of the soy produced in the United States comes from genetically modified plants, which is a concern to some. It’s the least allergenic of milk alternatives. Rice milk is naturally sweeter than other milk alternatives. It’s high in carbohydrates, so it’s the least desirable choice for people with diabetes. Eating too much of a rice product may pose a health risk for infants and children due to inorganic arsenic levels. The fat in it may actually promote weight loss. It’s high in saturated fat. It may contain carrageenan, which may cause digestive issues in some people. NOTE: This morning on television I technically said coconut milk has “no allergens”. I meant to say it has “less allergens” in that it rarely causes allergies. I apologize for not clarifying more specifically.